Highlights energy flow and improvement opportunities via Sankey Diagram interface as part of ISO 50001 Energy Planning process. Powerful visualization of energy flow from energy sources to significant energy uses (SEU’s) within a plant or building via a Sankey interface. Ability to add improvement opportunities and visually see the energy and cost saving impact on the organization. This tool helps you generate a compelling business case for pursuing a systematic energy management whether or not your organization is seeking ISO 50001 certification. Whether you are moving to a more systematic approach to energy management or at the initial stages of seeking ISO 50001 certification, this product instantly provides a visualization of your site’s energy flow to see where energy is being used, how much energy is unaccounted for and the impact of your energy saving opportunities. 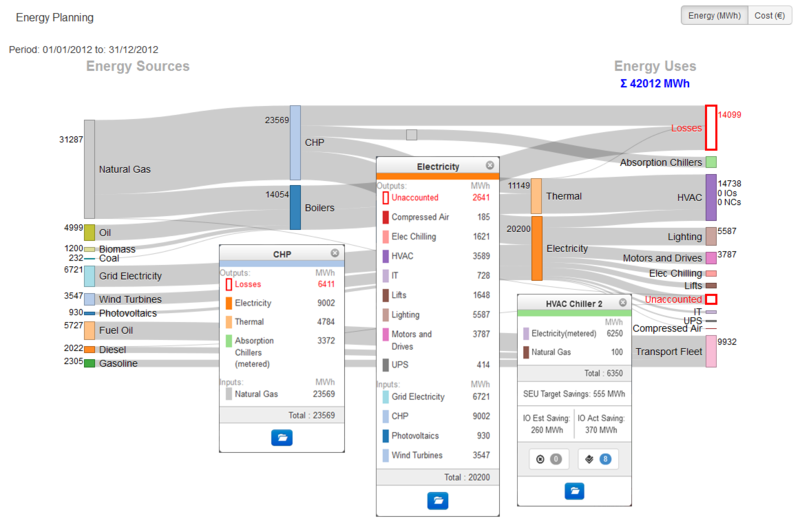 The visualizations support your business case for further energy efficiency investment. The information generated through using this tool is also the basis of an ISO 50001 Energy Review – the starting point for organizations seeking certification. The Enerit Energy Flow Assessor is an essential tool for Energy Consultants assisting clients at the early stages of their energy management or ISO 50001 explorations. The visualizations of energy flow and impact of potential improvement opportunities support business cases for further feasibility studies and energy investments. Free download of your data at end of contract. Customers who upgrade to Enerit Systematic Energy Manager or Enerit ISO 50001 Manager Pro will be credited for any unused period of their Enerit Energy Flow Assessor term contract. Pricing valid for new customers or existing customers who are seeking to expand existing systems. Contact Enerit sales team to order.